The Canning Co. decorative painting and traditional finishing skills include complex stenciling, trompe l’oeil, gilding, glazing, and simulated stone (marbling). Our knowledge of traditional materials and how they interact is also a key element when inpainting to match and replicate existing original work. Our new, period design projects reference past masterpieces, like the 1st-century decoration of Santa Maria Maggiore Basilica in Rome, and the fine detail of 19th-century Herter Brothers. John Canning Co. refinished the historic woodwork throughout the house, plaster restoration, and installation of reproduced wallpaper of the Mark Twain House. John Canning Co. conserved and restored all aspects of the Luzerne County Courthouses historic fabric: marble, metal, plaster, paint, and artwork. 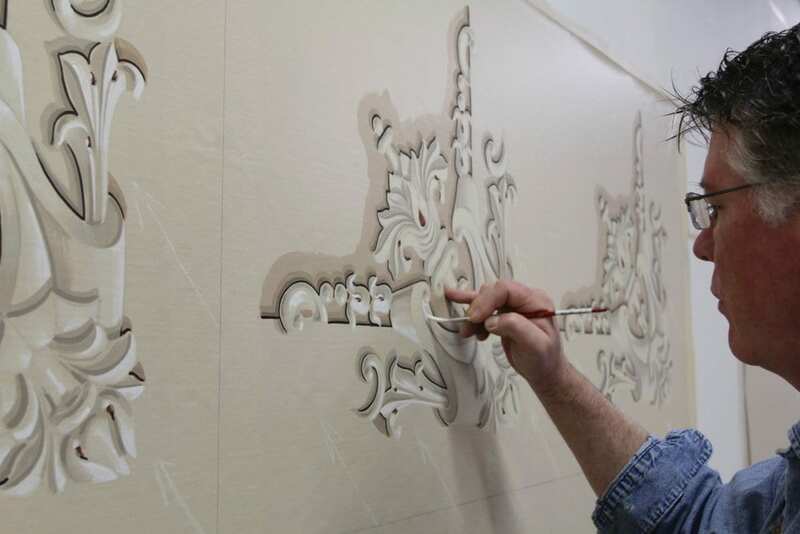 John Canning Co. traveled to Hawaii to restore the historic Islamic stencil decoration at Doris Duke’s Shangri La, Center for Islamic Arts and Cultures. John Canning Co. applied traditional gold leaf and gilding on the Charles Bulfinch dome and Lady Justice statue atop Connecticut’s Old State House. John Canning Co. artisans implemented a historically accurate marbling finish on the Great Hall Columns at the National Building Museum in Washington DC. John Canning Co. provided the Rhode Island State House conservation, cleaning, and restoration of the dome murals, painting, and architectural gilding. John Canning Co. provided decorative painting replication services for both wood and plaster surfaces at a private residence in New Hampshire. John Canning Co. provided ornamental plastering for the ceilings and walls at a private Boston residence by creating plaster molds and castings. John Canning Company created new ornate decorative finishes and murals for a private residence in Brookline, Massachusetts. John Canning Co. collaborated with Governor and Mrs. Manchin to create new designs and scenic paintings for multiple rooms in the Governor’s residence. John Canning Co. conserved and restored several spaces in the French Consulate in NYC including all surfaces in the West Room, East Room, and Gallery. John Canning Co. investigated and restored the decorative treatments and motifs of the Mahaiwe Performing Arts Center in Great Barrington, Massachusetts. John Canning Co. was a specialty contractor for the Metropolitan Theatre to conducted research and hands-on investigation of the historic finishes. John Canning Co. coordinated all work and trades, responsible for the restoration of all designs for the Art Deco movie theatre built by Warner Brothers. John Canning Co. served as a consultant for restoring the decorative paint, stone & marble, gilding, and metal refinishing at Massachusetts Institute of Technology. The John Canning Co. restored the interior decoration at the University of Michigan Hill Auditorium with decorative painting, transparent glazes, and gilding. John Canning Co. conducted archival research, hands-on investigation, and interpretation to inform the restoration of plaster, wood, and decorative finishes. John Canning Co. provided the decorative painting on Alumni Hall’s ceiling, executed on canvas in the Canning studio and installed on site. At Gasson Hall, Boston College, Canning Co. provided historic finishes investigation and analysis needed to restore the interior to its original design. John Canning Co. combined preservation research, restoration, and conservation of the original Jesuit chapel sacred design with new decoration elements. John Canning Co. restored and conserved the interior decoration painting, architectural gilding, and plaster at Rackham Auditorium, University of Michigan. John Canning Co. used historic photography to recreate the original Louis Kahn mural design directly on cinder block at the Bath House in Trenton, New Jersey. John Canning Co. provided the decorative finishes on the new coffered ceiling at the Union League of Philadelphia based on a historic sketch by Trumbauer. John Canning Co. created the cleaning agent and process for the thorough and harmless cleaning and restoration of the Grand Central Terminal ceiling mural. John Canning Co. was a prime specialty contractor and conservator for Independence Hall, restoring the courtroom and entrance hall’s original decoration. John Canning Co. performed decorative finishes analysis and consulting for the Eisenhower Executive Office Building’s historic suite of rooms. John Canning Co. was entrusted with the restoration and conservation of historic decorative painting and gilding originally designed by Thomas Jefferson. John Canning Co. restored the decorative paint of the patinated railings in public stairwells and ornately gilded surfaces in the Main Treasury Building.